Marcia has perfected her woodblock technique and style over the years to create a unique style that reflects her whimsical personality. Like her paintings, Marcia creates woodblock prints of what surrounds her daily life: oceanscapes, sea life, waves, and tropical botanicals. She is able to portray Polynesian and Hawaiian stories with her signature surrealist style while being sensitive to maintain cultural integrity. Original woodblock print on paper. 22"x30". Go to Contact page to inquire for price on piece and shipping. Original woodblock print. 24"x36". Go to Contact page to inquire for price on piece and shipping. 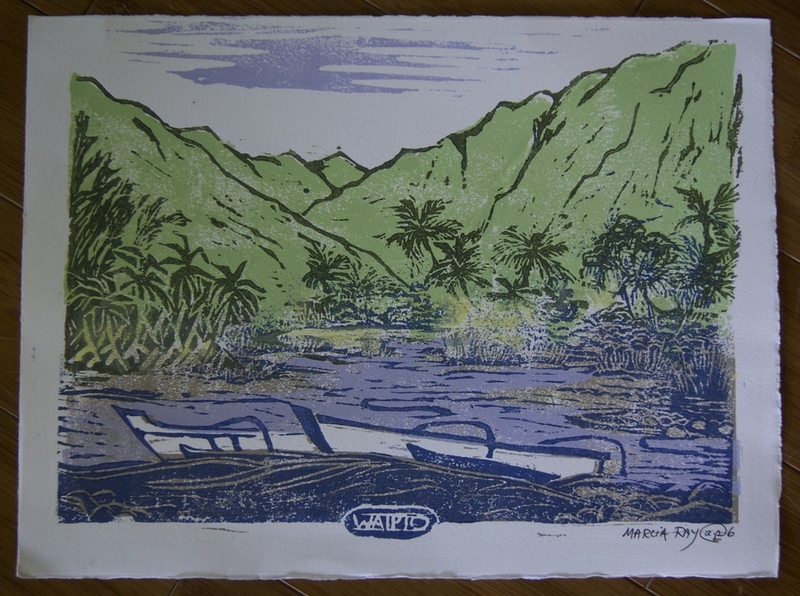 Original woodblock print. 30"x22". Go to Contact page to inquire for price on piece and shipping. Original acrylic on canvas. 40"x30". Go to Contact page to inquire for price on piece and shipping. Original woodblock print on paper. 30"x22". Go to Contact page to inquire for price on piece and shipping. Original woodblock print on paper. 15"x11". Go to Contact page to inquire for price on piece and shipping. Original acrylic on canvas. 32"x54". Go to Contact page to inquire for price on piece and shipping. Original woodblock print on canvas. 34"x54". Go to Contact page to inquire for price on piece and shipping. Original woodblock print on canvas. 32"x54" Go to Contact page to inquire for price on piece and shipping. Original woodblock print on two muslin panels. 36"x54". Go to Contact page to inquire for price on piece and shipping. Original woodblock print on three canvas panels. 36"x32". Go to Contact page to inquire for price on piece and shipping.